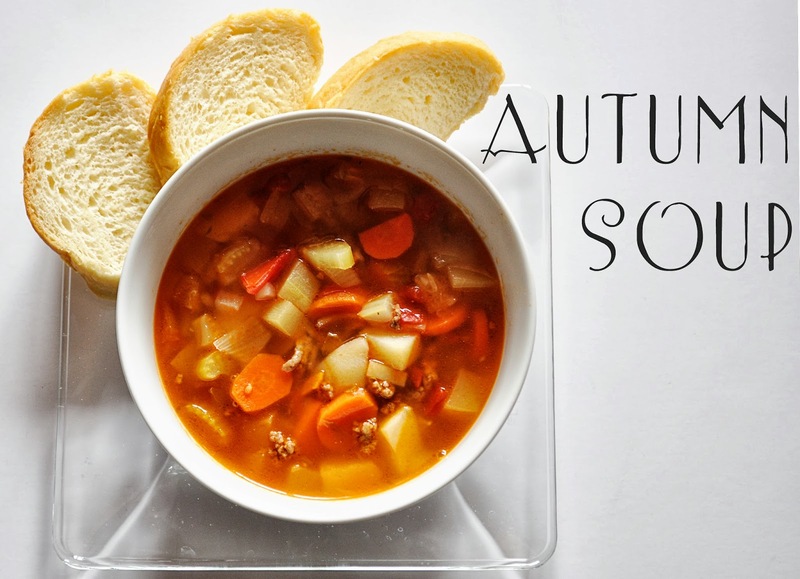 Starting in the Fall and going into Spring, we have soup each week. As I meal plan, I always look for a soup to have that week. So we try lots of soup recipes (because I have this thing against eating the same recipe in twice in a 30 day period). This soup is seriously amazing. Why? Because you take a bunch of ingredients from your garden and make a delicious soup. It is my favorite soup to use up a bunch of the stuff in my garden that is going out of control. 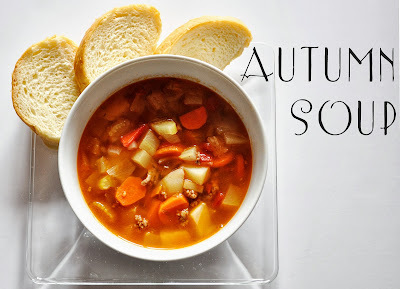 My husband says it “tastes like Fall.” But don’t worry! You don’t need a garden to eat this soup. These ingredients should be cheap at the store, too. Brow together meat and onion. Drain fat. Add water. Add remaining ingredients. Bring to a boil and simmer for 20 minutes or until veggies are soft. Above is the recipe as written. Here is how I change it. I do not use a bay leaf. I double all vegetables. And note that you don’t need every one of those vegetables for this soup–if you don’t have one, make it anyway! I also double the water, salt, and the bouillon. I keep pepper the same. I use fresh tomatoes instead of canned. The upside is better flavor. The down side is the skin comes off in the soup, which might be displeasing to some of you. If so, you could blanch the tomatoes first to get the skin off. Or you can just use canned tomatoes. For the herbs, I use fresh herbs and do quite a lot of them. Oregano and basil are my two favorite herbs so I load them in there. Plus my basil plant’s days are numbered, so I want to use up those leaves! My “dash” of Worcestershire sauce is probably closer to a Tablespoon, but I don’t measure it out. Serve with bread. You can do rolls, breadsticks, french bread, baguettes, or even just a loaf of bread you bought at the store. Some of my kids are not big soup fans. When I feed them soup, I take the ingredients and put them on a plate. So potatoes, carrots, celery, meat, etc. all on the plate without any broth. I usually use the divider plates. Then they eat it just fine. They like the ingredients, it is just having them all together in a liquid that is disconcerting to them. I love feeding soups like this to older babies, pre-toddlers, and toddlers. I do the same as I listed above; I take out the individual ingredients. I then make sure each piece is a good size for that individual child. Yay! I can't wait to try! I love good soup recipes. I have a question about one of your postings from way back. Its from the Brinkey Week 4 schedule. In the post you write baby falls asleep on her own. Our baby will only sleep if we rock & hold her for quite sometime. It's on,y like this during days this common? How did you get your young one to fall asleep on her own, crying it out? She didn't have to CIO–I did the 4 S's with her–see my post on that. Only we just had to do the first three S's. Since you have been rocking, there is a good chance you will need to do something more like CIO or including the fourth "S" or some other sleep training method to get your baby to fall asleep on her own.